Classical’s stellar season has been highlighted by extra inning victories over ranked opponents Poway and San Pasqual. Good teams had best beware! Going into extra innings with the Classical Academy baseball team can be one dangerous proposition. Twice in two weeks, a pair of high-profile clubs have gone that route only to come up frustrated and empty. First to fall victim to Classical’s knack for getting it done in overtime was highly-regarded and 11th-ranked San Pasqual who lost a nine-inning 10-8 affair to the Caimans on March 23. Now fast forward to last Friday night’s contest at the Poway High diamond where the host Titans were riding a massive 11-game winning streak, not to mention being unbeaten in seven home outings. But thanks to the surging Caimans (10-2), those streaks came to an abrupt end in the wake of a 4-3 CA win that took eight innings to resolve. By taking down a Titan team that came into the fray rated an exalted No. 3 in the county and hadn’t tasted defeat since late February, Classical not only extended its own notable winning skein to seven games but could make a significant move upward in this week’s Top 10 rankings. 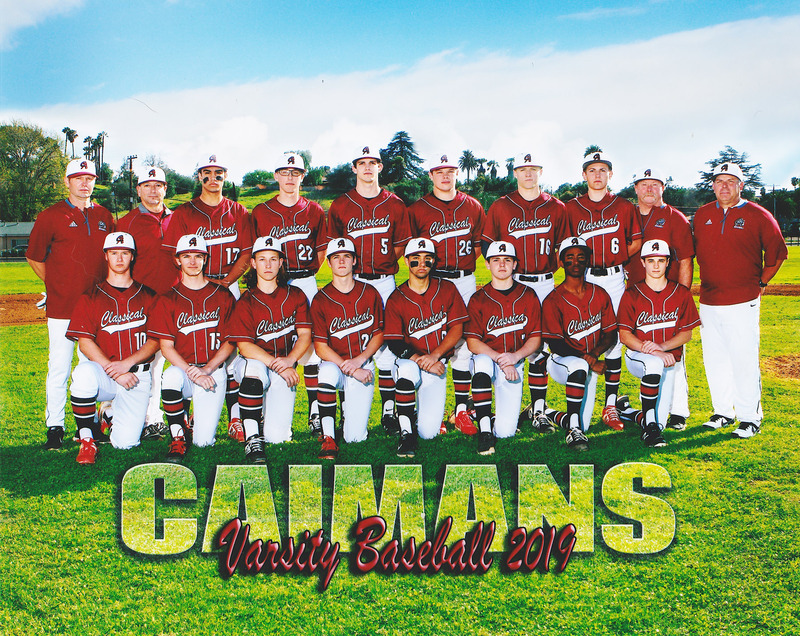 Without a doubt, the Caimans are clearly on a roll and have the look of a squad that could do some serious damage once the postseason commences. An indication of a resourceful club is that it can take advantage of an opponent’s miscues and that certainly was the case in CA’s victory over the Titans. The Caimans managed to scratch out just four hits but they were able to capitalize on costly Poway errors that led to all of the CA runs being unearned. Though their offensive stats weren’t exactly robust, the Caimans did just enough at the plate to get the job done. Versatile Zack Jordan doubled and drove in a run while sophomore infielder Michael Moody delivered a single and scored. Dane Kelsey was also a contributor as he drew a walk and tallied twice. Meanwhile, outfielder Tim Boshaw coaxed a pair of bases on balls and touched home once. The other two Caimans hits came off the bats of athletic Noah Dull and youngster Binyam Gebhardt. In addition to his effort with the bat, the 5-11 Jordan turned in a gutsy performance on the mound that resulted in a well-earned W. Pitching to contact, the right-handed senior unloaded 109 pitches in a seven-inning outing in which he yielded seven hits and three runs, only one of which was earned. The only real difficulty Jordan encountered came in the bottom of the fifth when the Titans scored all their runs—which included a home run blast off the bat of outfielder Jack Sanders. After the Caimans pushed across the go-ahead run in the top of the eighth, it was then left to reliever Vince Marcantonio to come in from the bullpen and close things out. Though he made things interesting by yielding both a hit and a walk, Marcantonio also registered a strikeout and was able to shut the door when it mattered most to preserve the win. Based on their splendid overall record, the Caimans have definitely shown that they can take care of business in regulation. But when it comes to extra innings, any foe – particularly a formidable one – had best be on guard because that seems to be the time when Classical might be at its very best.